I wasn’t at the top of my game yesterday and skipped posting a card. Today is better, and I wanted to say thank you to all who wished me well yesterday. I love this card but may have to experience it in a low-key way as sinuses and a winter weather advisory may cancel a chance to gather with my sisters in our Hearth group tonight (yes, it’s really called that – I’m not just saying that because of the card title). Here’s to all of us experiencing the warmth and friendship of the hearth today! MEANING: A hearthfire gives warmth and light in the deep midwinter. Warmth of life, love, and friendship are shared generously. There is a sincere desire for celebration, security, and harmony shared with companions and kindred spirits. This also leads to the attainment of innermost peace and the feelings of personal well-being and achievement. 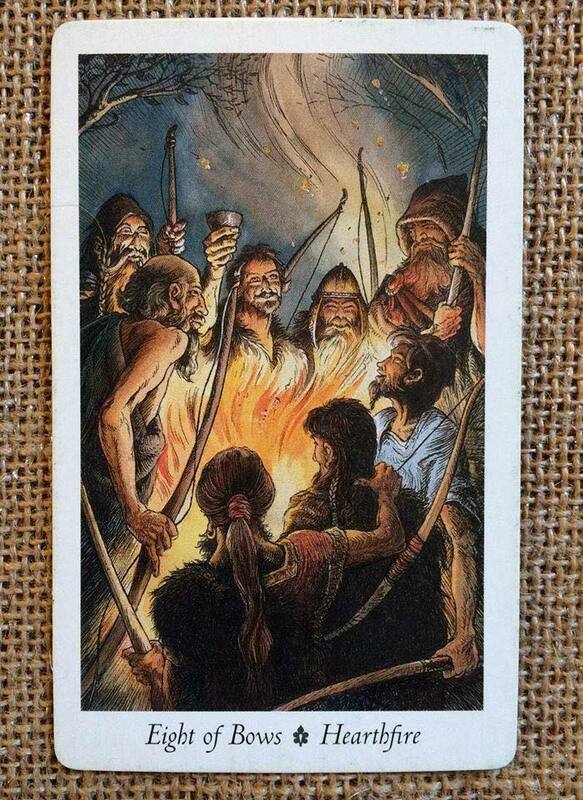 DESCRIPTION: On the edge of a sparse, winter forest camp, lit with the warm, dancing flames of a large log fire, we see eight figures gathered around a roaring hearthfire. The merry band raise goblets, shake hands and laugh, bathing in the shared bond of fellowship and harmony created by the true loyalty of lifelong friends.